Empathy is a word often thrown around and misunderstood by couples that come into my practice. Many times I’ve been sitting with a couple, and one of the partners will express a need or desire for more empathy, and the other will defend, saying that they DO empathy. Sometimes couples even argue about what empathy is-not a winning strategy. So let’s start with a definition. 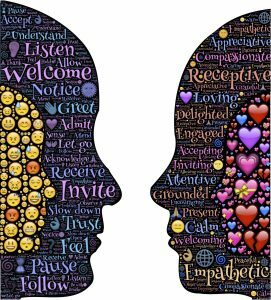 Empathy, as it relates to couples counseling, is the ability of a person to have identification with, and/or an understanding of another persons feelings. It’s possible to understand how somebody feels, even if we don’t feel the same way. Compassion has empathy as a component, but also includes the heartfelt desire to alleviate the suffering of the other person-including taking responsibility for what we may have said or done that caused harm. But Empathy comes first. We gain understanding first, prior to expressing a desire to alleviate the suffering. In this clip below, Bene Brown details the difference between empathy and sympathy. Without getting too caught up in the semantics of the words-what most couples are looking for when they share their feelings with their partner is for their partner to understand. As Dr. Gottman has found and stressed as a result of his research, couples thrive when they work towards understanding each other, by being on each other’s side, rather than looking to help or fix their partners difficult feelings. We’ve all been on the losing side of an exchange with our partners where they share a difficult feeling, and we offer the kind of sympathetic responses in this video, the “look at the bright side” list. Empathy acknowledges its hard for the other person, and that you’ve had a hard time also. This is how we join each other in empathy. It's the key to emotional attunement with your partner . To have empathy is to really understand somebody, what they want, what they believe. And not just in the moment, but in general. It also includes trying to understand, to ask probing questions, in the hopes of understanding when you can’t. That would make me mad, too. Saying one of these empathetic phrases, if you mean it, is the building block to connection.